17th September, Yancheng: Fourth-seed, Jo Young Bin and Han Jae Hyeon of Korea and topseed, Kong Min and Peng Rui shared glory on the second day of the 28th East Asian Tenpin Bowling Championships by capturing the Men's and Women's Doubles gold medals. Jo and Han upset topseed, James Lui and Ernest Kwok of Hong Kong with a 418-395 victory in the Men's first semi-final match to advance to the final. Lui and Kwok had a good start with a doubles trike each while both jo and Han had opened frames in the first. But Jo bounced back with six strikes-in-a-row while his partner rolled three strikes-in-a-row. Lui had three back-to-back opened frames while Kwok added another double. The misses by Lui proved costly for Hong Kong having to settle for the bronze medal. Third-seed, Wang Zhiyong and Qi Wankang narrowly edged Singles gold and bronze medallist pair of Lee Won Seok and Oh Jin Won, 416-412 in the other semi to set up the clash with the other Korean pair in the final. The final was a one-sided affair as Wang had two early opened frames and Qi had a split in the third frame. The Koreans on the other hand, went on a strike-fest for a comfortable 481-372 victory to claim their second gold medal forcing China A to settle for the silver medal. In the Men's Squad B preliminaries contested earlier, Lui and Kwok topped the field with 2647 to earn topseed for the semi-finals. Squad A leader, Lee and Oh slipped to second while China A and Korea 1 made up the top 4 semi-finalists. 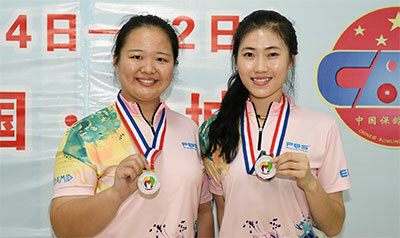 Chinese Taipei's Shen Ying-Te and Lin Pai-Feng, who finished second to Hong Kong in the second squad, missed the cut by 31 pins and finishing fifth overall. Meanwhile, host China A earned their first gold medal of the championships after topseed, Kong Min and Peng Rui outclassed third-seed, Han Jin A and Hong Hyeon Jeong of Korea 1, 432-390 in the Women's Doubles final. Peng had a clean game in the final including four strikes-in-a-row from frame seventh for 222 and although Kong had a split in the seventh frame, she managed a double in the second and third frames and struck home for 210. Han had back-to-back splits in the fourth and fifth frames but had three strikes-in-a-row for 188 while Hong had two doubles and a split in her final frame for 202. The champion had identical score when they ousted fourth-seed, Choi Hyeon Ji and Kim Chae Won, 432-389 in the first semi-final match to reach the final. Han and Hong thrashed second-seed, Wang Ting-Wen and Wang Ya-Ting of Chinese Taipei, 479-415 in the other semi to set up the finale with the Chinese pair. After two events, Korea has won 2 gold, 1 silver and 4 bronze medals to lead the medal tally. Hong Kong hauled 1 gold, 1 silver and 2 bronze medals in second while China A picked up 1 gold, 2 silver and 1 bronze medals. Competition will shift to the Trios event which will be conested over two blocks of 3 games each tomorrow. The top 4 Men's Trios and the top 4 Women's Trios will advance to the semi-finals shootout.